I made this to use with a Patreon poll I was trying to make. But I didn't realize until AFTER I had finished this that attaching an image is a PAID feature of the site I was using to make the survey... So now it's just going here for funsies. Little Otter must be rich. Naw... It's like $6.50... Which, I suppose to an otter, that would be quite a windfall. Especially if most of it is shiny coins. Why you gotta be so cute? It's a natural defense mechanism. It lulls people into a false sense of security then BAM! I steal their wallets! Oh, huh, that's interesting. So, do you only do it when----hey, where's my wallet? Did you take my wallet?!?! "Wait, I should pick that up. It's my lunch money..."
Gosh... your otter is so adorable. Thank you! But your huskies are cuter! Rollin' in the green, too! :D We're talking tens of dollars here! Go buy a day at the spa and get yer tail floofed! Hey bro your previous profile picture is a pickle with a face, why is it that it looks like an otter now? There's nothing quite as beautiful as money! Dangerous combo! 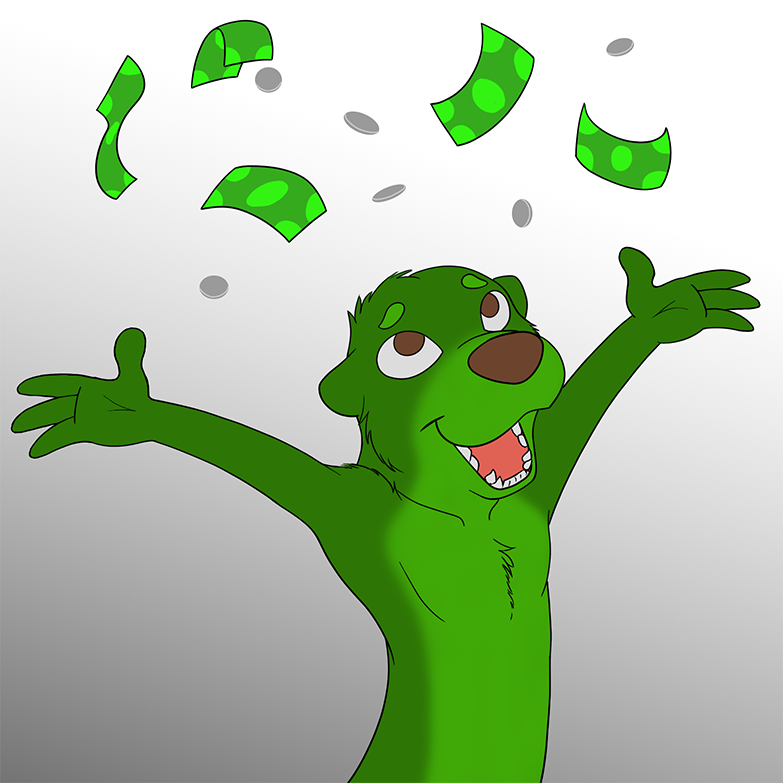 An otter with money can be up to no good! Oh yes, a couple of ones and some quarters. That's what we like to call a "baller on a budget." Gonna hit up the Dollar menu at Micky-Ds! LOL, I get the title. It's from a rap song call "Cream" by the Wu-Tang Clan. The rap is "Cash rules everything around me, CREAM, get the money, dollar dollar bills y'all.